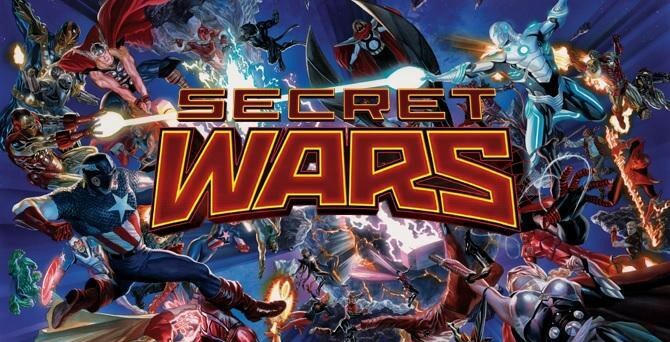 I can’t remember the last comic event I read that was as gripping as Marvel’s blockbuster summer event, Secret Wars. Not only is SW living up to the hype, it could very well surpass expectations if Jonathan Hickman maintains the level of storytelling we’ve seen so far. When Marvel first announced SW my initial reaction could be summed up in one word – What? The whole event was shrouded in a veil of mystery. What is Battleworld? How did it come to exist? I needed immediate answers!! Along with general confusion, I dreaded the renumbering of the comics I was currently reading, which probably wouldn’t have bothered me in the slightest had Marvel not been all too fond of renumbering over the last year or so. But, three issues into SW and the story feels fresh and exciting, while Hickman’s use of characterisation is compelling and seems to be a central focus of the story. Issue #3 finally starts to deliver some of the answers that plagued my mind when SW was announced, and it seems it was worth the wait to find out. WARNING: THE REST OF THIS REVIEW WILL CONTAIN SPOILERS. 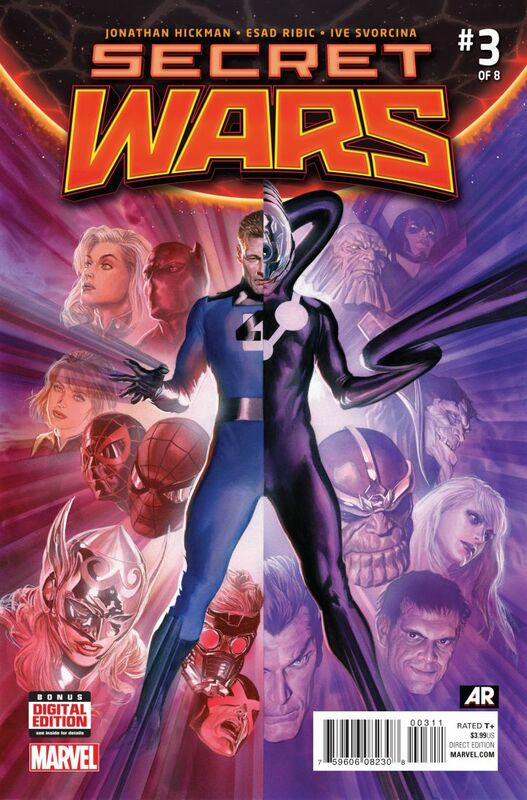 Issue #3 starts to delve into the how and why of SW, but Hickman isn’t willing to give everything away at once. He seems content to build pace slowly, only revealing bits and pieces of information regarding the origin of Battleworld. His storytelling is calculated; he reveals only what he wants and issue #3 starts to narrow the broad scope of the previous two issues. Hickman reintroduces the survivors of the incursion, both protagonists and villains, although the line between the two isn’t so clear-cut. The focus of this issue centers mostly on Victor Von Doom as he reigns over Battleworld as a deity. We finally learn how Battleworld supposedly came to be, crafted by both Doom and Doctor Strange, who now serves as Doom’s Sheriff. The interactions between Doom and his counsel are the most compelling aspect of the book, as Hickman’s characterisation of Doom is mesmerizing. Hickman writes Doom as well as Denny O’Neil writes Batman. He just understands him. Doom’s tyrannical ego is juxtaposed with the tragic man behind the mask, as he seems haunted by his own mortality. 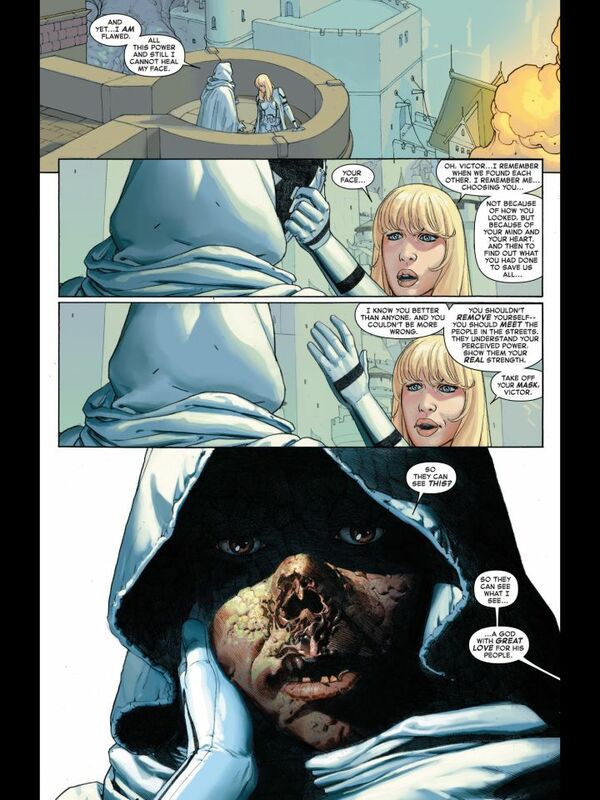 This is is magnificently represented in a harrowing panel by Esad Ribic, which grotesquely illustrates Doom’s deformed face, while Doom proclaims “All this power and still I cannot heal my face.” Has Hickman written Doom into SW as a protagonist rather than a villain? I wouldn’t be surprised if this was the case, but can Doom resist his evil ways as he struggles to maintain his rule over Battleworld? Hickman has written some fantastic dialogue in this issue, thankfully since it is quite wordy. Doom’s dialogue is complex yet revealing, and Doctor Strange becomes the voice that answers reader’s questions concerning Battleworld. The survivors of the incursion have somehow landed on Battleworld and they function as the reader within the comic– their questions are the same ones we have. Ribic’s art captures the scope of SW perfectly, and his art enforces a sense of realism in an otherworldly setting. Couple Ribic’s stunning art with Ive Svorcina’s colours and the result is near-flawless art page after page. The detail within each panels helps to bring Hickman’s story to life as it captures the magic within Battleworld. Ribic’s settings reinforce the idea that Battleworld is Doom’s Kingdom through the inclusion of castle-inspired buildings while the throne, Yggdrasil – The World Tree, is reminiscent of something from Shangri-La. Overall, SW is proving to be an epic event that is not to be missed. Marvel built the hype and thankfully Hickman has delivered on it so far. The writing is skillfully paced as the story of Battleworld unravels slowly, careful not to reveal too much as once. Ribic delivers exceptional art that only enhances the spectacular world Hickman is forging – this is storytelling at its finest.